Dubai cultivates an ultra-modern image of dazzling architecture and effortless wealth. Yet its deserts conceal forgotten cities and a hidden history which reveal how its early inhabitants adapted and overcame dramatic past climate change. There is no question that Dubai is the ultimate 21 st century city. It boasts the tallest building in the world, attracts thirteen million visitors per year, and its airport recently claimed the crown of busiest in the world, by number of international passengers. So it’s understandable that archaeology and antiquities are not things that most people associate with Dubai and the United Arab Emirates. Yet this desert kingdom has a surprisingly rich history. Far from being empty desert, the UAE has many lost cities and archaeological sites that are only now being explored, and which reveal an unexpected story of human development in the Arabian Peninsula – from over 100,000 years ago when humans first ventured ‘out of Africa’, through millennia of a nomadic hunter-gatherer existence, to developing farming and then becoming a major centre for a world-changing technology – bronze. Map illustration from 'Sand Kings of Oman' published by Methuen in 1947. The ‘Land of Magan’ as it was known rapidly became the major supplier of bronze for tools and weapons to the entire Middle East region, and in particular to the world’s first cities which were emerging in Sumeria at that time, cities such as Ur and Uruk. Bronze helped make farming more efficient and civilization possible in these places. Numerous build­ings, tombs and sections of falaj water­courses dating from this time have been excavated over an area of about fifty acres at Hili just north of Al Ain, the UAE’s third largest city, and are the centerpiece of the UAE’s only UNESCO World Heritage site. 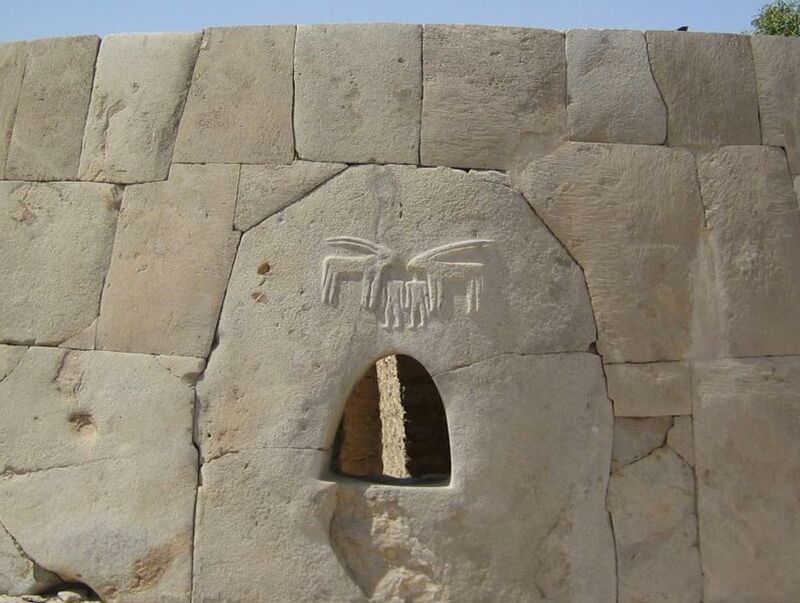 The highlight is a beautifully restored circular tomb roughly ten metres in diameter with a decorated entrance­way with two oryx carved above it, stone blocks cut so precisely that you couldn’t get a piece of dental floss between them (see featured image). They’re like a smaller ver­sion of the great Inca stone walls at Machu Picchu, except that those are relatively recent constructions at a mere 500 years old, whereas the stonework on the Hili tomb is 4,700 years old. Moving forwards 2,000 years, iron had replaced bronze and was revolutionizing life in the Arabian peninsula, and a key location for producing and working iron was Mleiha, a fortified town on the edge of the desert near Al Dhaid, roughly an hour’s drive from Dubai. In its heyday at around the time of Christ, Mleiha was one of the largest settlements in the region – a city a mile wide with hundreds of houses and metal-working sites, continuously inhabited for over 500 years from the mid Iron Age until the 1 st century AD, when it was abandoned and forgotten, its walls left to crumble and be covered by drifting sand. The partly restored walls of it large square fortified iron foundry, about 200 feet square, are today housed under a metal hangar. Excavations have revealed two iron-foundries, producing both weapons and coins, protected by the fort and surrounded by many houses, indicating that a significant number of people lived and worked there. Iron ingots and finished products were transported from Mleiha north to the coast at Tell Abraq and Ad-Dur, from where they were shipped up the Persian Gulf to customers in Mesopotamia and the Levant. Tell Abraq and Ad-Dur are remarkable sites in their own right. Tell Abraq itself was continuously inhabited for two thousand years from soon after Hili was occupied, and has been an active archaeological site for many years. Nearby Ad-Dur lies on the coast opposite modern Umm al-Quwain and is an enormous site about four miles across. It is easy to explore, the stones of its ancient houses lying undisturbed amongst the coastal sand dunes. One of the most famous lost cities of Arabia – tantalizingly so because historians have known it existed from written records but simply could not find it – is the medieval city of Julfar. Home to the legendary Arabian seafarer Ahmed ibn Majid, as well as allegedly to the fictional Sindbad the Sailor, Julfar thrived for a thousand years before falling into ruin and disappearing from human memory for almost two centuries. Unlike the desert cities above, Julfar was a thriving port, in fact the hub of southern Gulf Arabic trade in the Middle Ages. Julfar was known to be somewhere on the Persian Gulf coast north of Dubai, but the actual site was only found by archaeologists in the 1960s. The earliest signs of settlement found on the site date from the 6 th century, by which time its inhabitants were already trading as far afield as India and the Far East on a routine basis. The 10 th to 14 th centuries were a golden age for Julfar and for long-distance Arab trading and seafaring, with Arab naviga­tors rou­tinely traveling halfway around the world. Arabs had sailed into European waters long before Europeans succeeded in navigating through the Indian Ocean and into the Persian Gulf, for instance. As the main base for these voyages and trade, Julfar was the largest and most important city in the southern Gulf for over a thousand years. Arab merchants routinely made the mam­moth eighteen month sea voyage as far as China, and traded almost everything imaginable. Such a valuable commercial centre attracted constant attention from rival powers though. The Portuguese took control in the 16 th century, by which time Julfar was a substantial city of around 70,000 people. A century later the Persians seized it, only to lose it in 1750 to the Qawasim tribe from Sharjah who established themselves next-door at Ras al-Khaimah, which they continue to rule to this day, leaving the old Julfar to gradually decay until its ruins became forgotten amongst the coastal sand dunes. Today most of Julfar in all likelihood remains still hidden beneath the sprawling dunes north of Ras al-Khaimah. The desert which covers roughly 95% of the UAE undoubtedly still hides many secrets. Almost every year significant discoveries are made which fill in a few more blank spaces in the jigsaw puzzle of this most remarkable country’s past. However all of these sites plus many others (described more fully in my book Beyond Dubai: Seeking Lost Cities in the Emirates ) are within an hour’s drive of Dubai and readily accessible to the public, adding a different and exotic dimension to any visit to this most modern of cities. You said..."...They’re like a smaller ver­sion of the great Inca stone walls at Machu Picchu, except that those are relatively recent constructions at a mere 500 years old,..." . I think that You are wrong! In that date Spanish conquered America and Machu Picchu (and Cuzco ect. ect.) were build? People are often surprised at the comparative 'youth' of empires like the Inca and their extraordinary works. I was in the deserts of Dubai last year staying just 20 mins from Al Ain and am now kicking myself that I didn't look beyond the stunning deserts and wildlife for some of these ancient clues. Next trip! I'll def read your book first. Thanks for posting. I tink that if Incas buided the walls in 1450 they was able to do it now. Instead they are not, and they say ‘the gods builded them’.